Usually ready-made lace designs are sewn onto an item or garment once the lace design is embroidered. That's why Free-Standing Lace Designs are so easy to use for people who don't know to embroider exactly at the place they want. When a lace design is ready, it takes only seconds to position it at the perfect spot on your project. Then you can attach it to the item or garment, using matching thread. We have, however, found another technique for sewing CERTAIN TYPES of lace designs into garments. It's possible to do this automatically, while your machine is still embroidering the lace design. We call this technique "In-Hoop Lace Inserting." "In-Hoop Lace Inserting" has its pros and cons, of course. 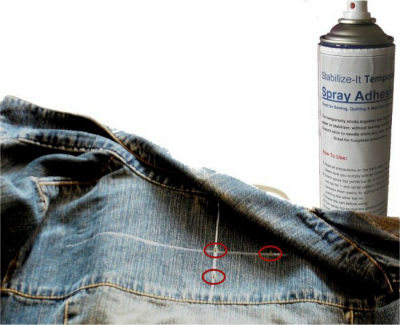 To use this technique, a design should be properly digitized, and you should start to embroider it exactly at the spot where it's supposed to be located. This requires some accuracy. Also, this will work only with single lace designs that have a "finished" look on their own and have a kind of frame around them. We are talking about the type of designs that are supposed to be positioned in the middle of the background fabric, NOT on its edge. 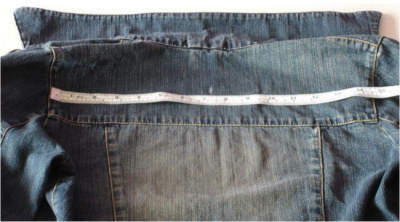 The most important advantage of this technique is that the design is sewn into garment so well that the garment can be laundered many times. You may want to use this technique when sewing lace into clothes or linens that must be laundered from time to time. Another great quality of this technique is that your machine can insert a lace design into fabric in such a way that seams will be absolutely invisible, since they will be located underneath the lace stitches. Embroidery machine can do this very neatly, and can "overlock" the fabric edges at the same time. It's a challenge to do it that well, manually. 1. Select an appropriately digitized Free-Standing Lace Designs that supports in-hoop insertion, and print its 1:1 scale paper template. 2. Hoop two layers of strong, water-soluble backing. 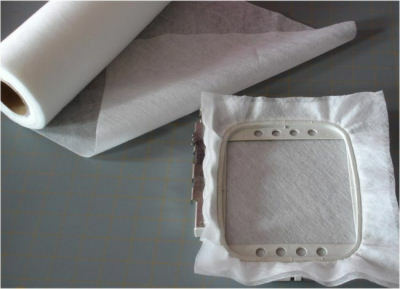 Fabric-type Water-Soluble Stabilizer is better than film-type WSB for this purpose. 3. Take the garment onto which you want to insert your lace design, position it over the hooped, water-soluble backing, and secure it over the backing. The spot where the lace design will be inserted should be exactly in the middle of your hoop. 4. When the garment is secured over the water-soluble backing, the first design thread is embroidered. This should be a running stitch. Its purpose is to outline the area of fabric where you should cut out a hole for the lace insert. 5. 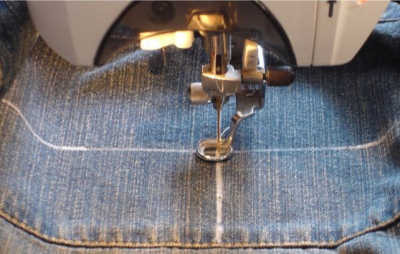 Once the first thread is embroidered, remove the hoop from the machine and carefully cut out the inside of the outlined area of fabric, as close to the stitches as you can. Cut away only the fabric. The backing MUST remain undamaged, to support the lace design. 6. 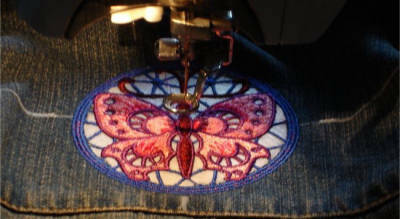 Insert the hoop back into the machine and embroider the rest of the design, following the thread change list. Once the design is ready, just take the garment out of the hoop, cut away the large edges of water-soluble fabric, and wash the rest of it away. in many cases. This approach is especially useful when you want to embroider it onto a piece of cloth where you don't want it to be translucent. Alternatively, you can do it as lace and then insert a piece of contrasting fabric behind the lace, after it has been washed. 1. Fabric-type Water-Soluble StabilizerWater-soluble fabric stabilizer. 2. High-quality polyester machine-embroidery thread. Regular 40 wt thread is perfect. Just make sure you purchase a quality brand. With lace designs, using strong and NON-stretchy thread is especially important, because they have many stitches, and you would probably prefer to drink coffee or do something fun while your machine is working, instead of babysitting each design for half an hour. Also, thread breaks can cause the laces to unravel later, and stretchy thread may cause your design to deform after laundering. We've also noticed that it is better to embroider lace designs at a slightly slower speed than at the high speed used for regular designs. The lace comes out more beautifully this way. 3. Properly digitized Free-Standing Lace Designs. 1. NEVER resize lace designs. Chances are good that this will ruin them completely. They are very sensitive and precise. While regular design may resize well, a resized lace design will most probably fall apart after you wash away the water-soluble backing. 2. If you are using new supplies (thread, stabilizer), try them out first on one small test design, to see if everything is okay. Stitch it, wash away the water soluble, and dry it, just to be sure that your backing and thread are working well together. Only then continue with your main project. 2. To put a round butterfly lace design in the very middle of the back, we located that middle by measuring the jacket back and making a vertical line across the middle of the back. (The mark is washable). Of course, this step will be a bit different for each new project. 3. Print the paper template of your design and put it over the garment for a moment, to make sure that the design size is okay. Then mark the horizontal line of the design template. Be sure to mark it so that the vertical and horizontal lines meet exactly in the middle of your design. Attention: It may seem to you that one layer of strong WSB is enough, but many machines start breaking thread terribly when only one layer on WSB is used. We've noticed that an extra layer of water-soluble backing often solves this problem. So avoid trying to save an extra layer, even if your WSB is very strong. On our photo, you see a fabric-type water-soluble backing. It looks, feels, hoops and embroiders just like fabric, but then washes away easily. For lace, it's better than the all film-type of water-soluble backings because it doesn't stretch and it’s not slippery. It holds better in the hoop, and better supports lace designs through the entire embroidery process. 5. Draw horizontal and vertical lines on the hooped WSB, exactly in the middle. Then insert at least 3 thumb tacks/pins from the bottom. 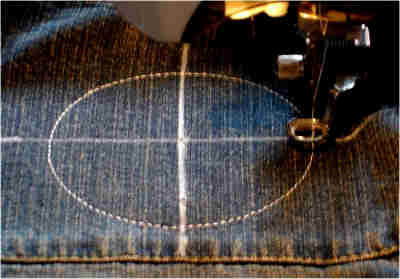 This is a small, but helpful trick that allows VERY precise positioning of the garment while doing hoopless embroidery. The tacks will help you center the garment and secure it on exactly the right spot. One tack/pin should be in the very middle, one on the vertical line mark and one on the horizontal line mark. 6. Apply a generous amount of temporary spray adhesive over the very edge of the hooped water-soluble backing. 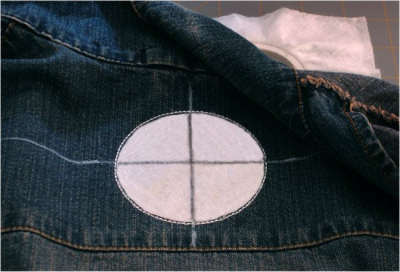 (The middle should be free of adhesive; otherwise, it may be more difficult to cut a hole in the fabric later). Position the garment exactly according to the marks on the stabilizer and on the garment itself. If everything is okay, the pins should come through at the center, horizontal and vertical lines on the garment. When it's positioned correctly, press the garment over the stabilizer, to make it stick well. The spray adhesive should hold the garment in place. Only then remove the tacks and insert the hoop into embroidery machine. 7. Embroider the first thread of the lace design. This should be a running stitch. Its purpose is to outline the area of fabric where you should cut out a hole for the lace insert. 10. When you've embroidered all the inserts you want, wash away the water-soluble backing in warm water. If you want the lace to be as soft as possible, you may even leave the item in warm water for half an hour or so, to make sure that all of the water-soluble substance dissolves. Dry your project carefully by spreading it flat on a towel, and enjoy the results! There is one more set in this technique. It's called Dantela Lace Blocks, and it also supports in-hoop lace inserting.